In 2017, The Community Foundation awarded $15,000 through the Quarterly Competitive Grants Program to Project Leadership to support their College and Career Readiness Initiative. Through this program, Project Leadership aimed to educate and recruit students into the 21st Century Scholars program; match 21st Century Scholars with adult volunteer mentors; and provide services to help students entering college make a successful transition. Project Leadership did just that. Working with middle school students, Project Leadership met with all who were eligible to educate them about the 21st Century Scholars Program. More than 85 percent of eligible eighth graders enrolled. High school 21st Century Scholars participated in a one-of-a-kind mentoring program that is a combination school – and community- based model where mentors meet with students once a week to help them with their academic and life choices. This school year, Project Leadership worked with 49 mentees including 11 graduating seniors. The graduating students completed their FAFSA and either plan to attend college or have other post-secondary plans. Project Leadership coordinated and staffed FAFSA labs at four Delaware County high schools and the Muncie Area Career Center helping 212 seniors identify $1.6 million in federal and state grant dollars. 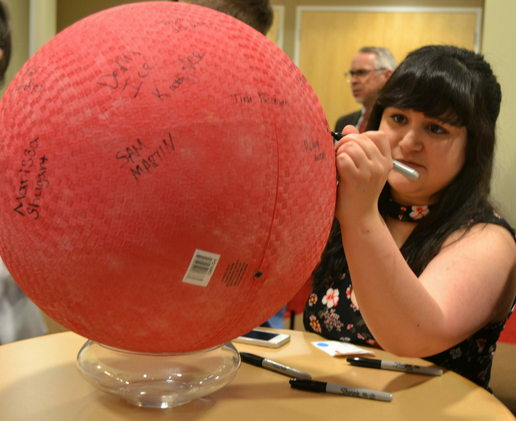 Each year, Project Leadership hosts the Red Rubber Ball Banquet, an event that honors mentoring program participants. Devin had been a part of Project Leadership’s mentoring program before he graduated from Muncie Central High School in 2015. Devin attended Ivy Tech directly after high school where he obtained his associate’s degree in general studies. He is currently finishing his junior year at Ball State University, working on his bachelor’s degree in criminal justice, with a minor in anthropology. During his banquet speech, Devin talked about his mentor and the impact he had on Devin’s life. “He helped me stay on the path of success and to be a better person. It’s always good to have someone outside of family to help push you, keep you on track, and most importantly, to never give up,” Devin said. Devin also mentioned that he learned about the importance of perseverance through his participation with Project Leadership and the 21st Century Scholars program. Make sure your goals are worthy of your perseverance. Take a step (even if they are baby steps). The Foundation is pleased to support the work of Project Leadership as they help students persevere through life’s obstacles to ensure they have the best opportunity to succeed in their careers and in college. Your gift supports your community and the things you care about. Donate today to make Delaware County a better place today, tomorrow, and always. The Community Foundation of Muncie & Delaware County, Inc.